Triode valve of 1937 for small battery equipment. Similar to the type used in the Proximity fuse Item A0478 but not as robust. This is not a Baird grid cell but a similar type. A Kerr cell is a device for the electrical modulation of light. The cell consists of a transparent container filled with nitro-benzene. Polarized light is passed through the liquid and between two banks of metal plates resembling the plates of a variable capacitor. As the potential across the two banks of plates is varied, so the polarised light beam is more or less rotated, away from the axis of rotation. Baird used these in experiments for television and one is present in his 'Televisor'. Further research was done to try and produce high definition television but this was unsuccessful due to the internal capacitance of the cell. A further drawback not directly connected with the Kerr cell, is the fact that light-modulation of this type is of use only with mechanical methods of scanning, and these, in themselves, are clumsy and unsatisfactory for high definition. Rev. John Kerr (1824 - 1907) was a Scottish physicist who inaugurated the field of electro-optics. Known as a Velocity Modulated Valve or 'Heil' tube for use as a Microwave a oscillator and requires a magnetic field for operation with the Anode connected by a Housekeeper seal (the copper disc), invented by A.A.A. Housekeeper, who solved the problem of making ductile metals bond to glass. In1935 A. Arsenjewa-Heil and O. Heil (wife and husband) were acknowledged for their contribution to velocity modulation theory . Cold Cathode tube loosely referred to as a trigger tube, used in electronic calculators having three elements a cathode anode and trigger element. The tube fires and glows when a voltage is applied to the trigger when a negative voltage is on the cathode and a positive voltage on the anode. The tube will only extinguish if the anode voltage is removed. Many devices can be connected in a line (10) for counting application, as in Sumlock Comptometers 'Anita' Calculators, used in the 1960's. The early computers of the 1940s and 1950s used the mature vacuum tube technology of the day. In the 1950s and early 1960s transistors were new and undergoing rapid development. They were also expensive and prone to failure if badly treated electrically. So it is no surprise that the first commercially successful electronic desktop calculator used vacuum tube technology. Device triggers like a neon at certain predetermined voltage , The trigger tube other wise known as a cold cathode tube fires or triggers when the voltage across is high enough. Can only be extinguished by lowering or removing the voltage. Unlike normal valves there is no heater required hence the term cold cathode. First produced in 1913 the grid and anode connection are on the side, the tube at the top contains asbestos which when heated drive a gas into the body of the valve and thus the vacuum could be brought to a proper degree of softness and thereby restore the characteristic curve to it's normal shape. The soft vacuum three electrode valve intended as an amplifier was much superior to any which had preceded it. The third electrode was introduced by Lieben- Reisz (Germany) and Dr. Lee de Forest (USA). The electrode consist of a nickel cylinder, nickel grid, and hairpin platinum filament coated with a mixture of barium and calcium oxides. A commercial type of the original Fleming diode, it has a flat plate anode and is covered in a gauze screen to protect it from external electric fields. These valves were made for companies by the Edison Swan Company probably at its Ponders End factory. This EVE173 has a nickel anode and grid. Around 1918, because of the shortages of material in Germany, the anodes were made of copper and in some cases the grids as well. The filament is 0.55amps 2.8volts Anode 40-70 volts. The R.S.5. was an RS4 with improved performance being produced at a rate of 25 per day in 1918. It operated with a filament current 3 amps from 8 to 12 volts depending on the valve, with 400 volts on the anode the output was 5 watts, with 600-800 volts it could be 10 to 20 watts.the valve was also made by Siemens and Halske, the glass work inside is of an excellent type. The valve is designed for possible oil immersion to facilitate cooling. Marconi MR1 (Marconi Rectifier No1). Similar to the unit that would have been used to power the transmitter for the first broadcast from Savoy Hill in 1922, in which Dame Nelly Melba Sang. The unit was used to turn the Mains Voltage which was Alternating Current into Direct current for the High Tension supply of the Main Transmitting valves. A Later version having an Octal base, of the Brimar 'Cathode-Ray Oscillagraph', similar to the 'Tunograph' but used to monitor modulating current for experimental purposes. The spot of light produced on the screen at the top could move across the screen in three dimensions. Unlike the 'Tunograph'. The earliest version of the CRT was invented by the German physicist Ferdinand Braun in 1897 and is also known as the Braun tube. It was a cold-cathode diode, a modification of the Crookes tube with a phosphor-coated screen. Early Rectifier valve made by Mullard Valves in the early 1920's. Barretters are temperature sensitive resistors used for stabilising voltages in wireless receivers, usually powering the heater circuits, of AC/DC receivers. Acting like a resistor but with constant current characteristics, a current over a particular range can be held constant over a range of varying voltage. A Barretter usually consists of an Iron wire held in Hydrogen filled glass envelope. Also used for many other applications. A Selection of Transistors and miniature valves, also a mercury wetted relay with box. There is a glass microscope slide showing the parts of a Germanium Transistor, a sectioned point contact diode showing the cats whisker, a U25 Extra high voltage rectifier used in Televisions, a Neon number indicator made by Mullard, and a solid state infra red detector. Also are various early, and not so early transistors. Micro Wave amplifying device that works by slowing the electrons through a coil of wire so that the beam of electrons running through it are caused to bunch. The signal through the wire is slower because it has further to travel, hence the name,Travelling Wave Tube. The bunching of electrons inside the coil is caused by interaction with the beam passing through it, at the first area of bunched electrons some energy is imparted back to the coil, as the process continues the bunch grows so that the next area of bunching becomes larger. this process continues all the the way to the end of the tube. Travelling Wave Tubes are used in Micro Wave link amplifiers and satellite systems. Glass tubes with 10 numbers inside one behind the other, viewed from the front and filled with neon gas. as each number is connected to a high voltage it glows. One side view and one end view. Used in Calculator machines such as the 'Anita' See Item A1157. The early computers of the 1940s and 1950s used the mature vacuum tube technology of the day. In the 1950s and early 1960s transistors were new and undergoing rapid development. They were also expensive and prone to catastrophic failure if badly treated electrically. So it is no surprise that the first commercially successful electronic desktop calculator used vacuum tube technology. Osram CMG8 early Photo Cell, possibly for the Movie picture industry and the beginnings of sound cinema. Early Photo Cell possibly for Movie projectors with sound. Early Photo Cell for detecting light, origin unknown. Photomultiplier tubes (photomultiplier's or PMTs for short), members of the class of vacuum tubes, and more specifically photo tubes, are extremely sensitive detectors of light in the ultraviolet, visible and near infra-red. These detectors multiply the signal produced by incident light by as much as 100 million times (i.e., 80 dB), enabling (for example) single photons to be individually detected when the incident flux of light is very low. The combination of high gain, low noise, high frequency response and large area of collection has earned photomultiplier's an essential place in nuclear and particle physics, astronomy, medical diagnostics including blood tests, medical imaging and motion picture film scanning (telecine). Semiconductor devices, particularly avalanche photo diodes, compete with them, but photomultiplier's are uniquely well-suited for applications requiring low-noise, high-sensitivity detection of light which is imperfectly collimated. While photomultiplier's are extraordinarily sensitive and moderately efficient, research is still under way to create a photon-counting light detection device that is >99% efficient; such a detector is of interest for applications related to quantum information and quantum cryptography. Elements of photomultiplier technology, integrated differently, are the basis of night vision devices. The photomultiplier, invented in 1936, is rooted in the science of the photoelectric effect, and that of secondary emission - i.e., the ability of electrons in a vacuum tube to, by striking an electrode, cause the emission of additional electrons. 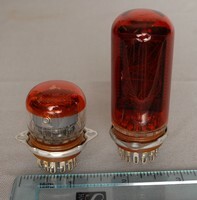 Photomultiplier's are constructed from a glass vacuum tube which houses a photo cathode, several dynodes, and an anode. Incident photons strike the photo cathode material which is present as a thin deposit on the entry window of the device, with electrons being produced as a consequence of the photoelectric effect. These electrons are directed by the focusing electrode towards the electron multiplier, where electrons are multiplied by the process of secondary emission. Decatron decade counting tube basically ten cold cathode tubes in one. A Decatron is a gas-filled tube. Dekatrons were used in computers, calculators and other counting-related devices during the 1940s to 1970s. "Dekatron," now a genericized trademark, was the brand name used by Ericsson Telephone. Internal designs vary by the model and manufacturer, but generally a dekatron has ten cathodes and one or two guide electrodes plus a common anode. The cathodes are arranged in a circle with a guide electrode (or two) between each cathode. When the guide electrode(s) is pulsed properly, the neon gas will activate near the guide pins then "jump" to the next cathode. Pulsing the guide electrodes repeatedly will cause the neon dot to move from cathode to cathode. This device is connected directly to wave guides and is used for transmitting on 3cm Radars. Eimac 15R Diode of 1940. Pentode amplifying valve of 1950. Triode valve for audio use. Mercury vapour type rectifier made by S.T.C. CV35 Reflex Klystron of 1935. A klystron is a specialized velocity modulated vacuum tube (evacuated electron tube). The pseudo-Greek word klystron comes from a Greek verb referring to the action of waves breaking against a shore, and the end of the word electron. The reflex klystron contains a REFLECTOR PLATE, referred to as the REPELLER, instead of the output cavity used in other types of klystrons. The electron beam is modulated as it was in the other types of klystrons by passing it through an oscillating resonant cavity, but here the similarity ends. The feedback required to maintain oscillations within the cavity is obtained by reversing the beam and sending it back through the cavity. The electrons in the beam are velocity-modulated before the beam passes through the cavity the second time and will give up the energy required to maintain oscillations. The electron beam is turned around by a negatively charged electrode that repels the beam. This negative element is the repeller mentioned earlier. This type of klystron oscillator is called a reflex klystron because of the reflex action of the electron beam. 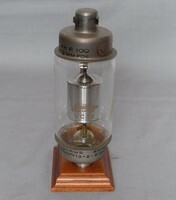 8012 RCA UHF Triode of 1940.It was used in equipment designed for jamming German Radar, particularly the APQ9 Radar jamming unit. BT5 Thyratron made in 1938 by A.E.I. in there Lincoln factory, which later became the Semiconductor division. Osram Gas filled relay, actually a triode valve acting as a high power switch. Power amplifier Triode Made by the Marconi Osram Valve Company, with a capability of 100 Watts. Using Molybdemum electrodes and Oxide coated filament designed specifically for use in output stages of power amplifiers. A pair of valves could be used in push pull, class AB with low distortion, generating 200 Watts. The valve became well known in PA amplifiers. It was also used in the modulator chain of the Marconi SWB8 and SWB10 transmitters. As it was used in Cinema amplifiers it became known as the 'Talkie Valve'. High Powered Triode, made in the late 30's early 40's. Western Electric 388A UHF Triode of 1938. 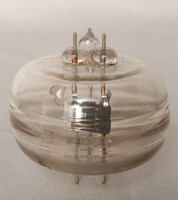 Power triode with Anode connection made to the top cap. The valves had carbon anodes with a dissipation of 40 Watts and were designed to work in Push-Pull pairs operating in class B. This class of audio circuit was both inexpensive and very efficient. It was estimated that an output of 175 Watts could be obtained by a pair of DA41/2's working at an anode voltage of 1,000 Volts. Using a Thoriated filament at 7.5 volts 2.5 amps. High voltage rectifier, with large Edison screw base. High Voltage Rectifier Valve, with twist base. Raytheon BH type B Cold Cathode Rectifier. This valve has no heater. Triode of 1936 with a DA4 pin base. An early X-Ray tube that has been over driven by Mr Lee, Causing an element to drop, before he donated it to the museum. On the top is a pillar containing Asbestos which when charged by high voltage re-gassed the tube. The firm A.C.Cossor Ltd was established in 1859, making Scientific glassware. Cossor Electronics started in 1875. Glass vacuum capacitor value 12 Pf 20kv extremely low leakage. High Voltage Rectifier Valve, used in pre war oscilloscopes and other equipment.